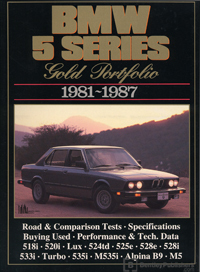 This BMW 5 Series Gold Portfolio: 1981-1987 is a collection of 50 original articles compiled from the pages of Autocar, Autosport, Cars & Car Conversions, Competition Car, Fast Lane, Modern Motor, Motor, Motor Manual, Motor Trend, Road & Track Sports Car Graphic, and Wheels. The information collected in these reprinted articles includes 20 road and track tests, plus specifications, touring and long-term reports. The first generation of 5 Series models was introduced in 1972 and established them as serious contenders in the mid-sized saloon market. The second-generation introduced in 1981 built on this reputation. Tuning firms produced expensive and exclusive versions although the standard cars had good performance. The astonishing turbo diesel 524td set performance and refinement standards for diesel passenger car engines. Here are the contemporary road test and model introduction articles, tech. and spec. data, drivers' impressions and comparison tests.